I'd be hardpressed to find the perfect spot for me in the universe, but I'm pretty sure there will be a fig tree involved. For where there is a fig tree, there is life aplenty. A raucous party with birds of all shapes and sizes will definitely be happening, for instance. 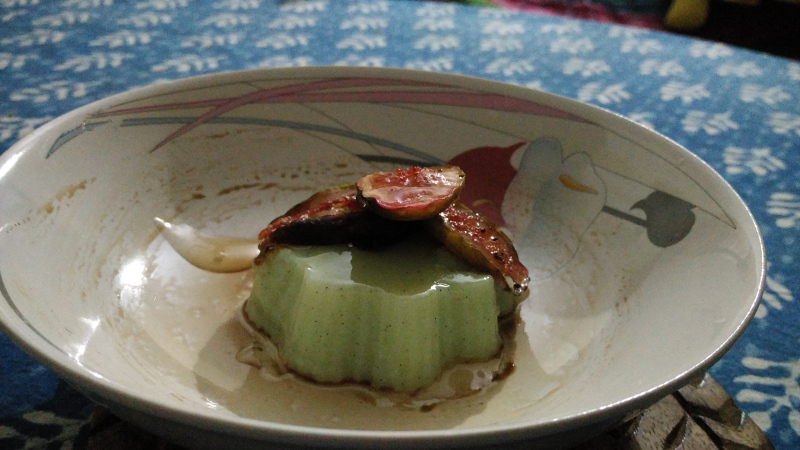 For someone who adores fig trees, I'm not a big fan of dried figs or anjeer as they are known in most of India. But fresh figs? Fresh figs, I can die for! The deep purple hues of a fig in the peak of ripeness, with ginger streaks of green calls to me like a beacon. And the vibrant red speckled with seeds that you can see when you bite into one? Um, divine! So you can imagine my joy when I found plump, ripe figs at the campus' weekly organic farmers' market last sunday. I knew exactly what I wanted to do with them - roast them in the oven, with a dash of cinnamon, until they are all oozy and caramelized from their natural sugars. Oh, I'm still salivating at the thought! There are a few magical combinations out there that most of the epicurean world loves - raspberry and white chocolate, apple and cinnamon, tomato and basil, mango/pineapple/guava/watermelon and salt/chilli powder/chaat masala, peanut butter and jelly, strawberry and aceto balsamico, caramel and sea salt ... You get the drift. In fact, Mashable has a neat listing of a 100 such food pairings that are so legen-waitforit-dary! Some of my favorite food pairings involve a surprisingly commonplace herb. This little herb marries wonderfully with chocolate, strawberry, cucumber, and lemon, among others. In my humble opinion, a sprig of mint brings in a shot of magic to many a dish and elevates it to another level. For instance, something just clicks, when one introduces mint to chocolate. Just adding a touch of mint, transports a simple dessert to realms far, far away. To summarize this soliloquy on a sprig of mint, it is the chocolatier's (not that I am one) equivalent of rocket fuel. Period.